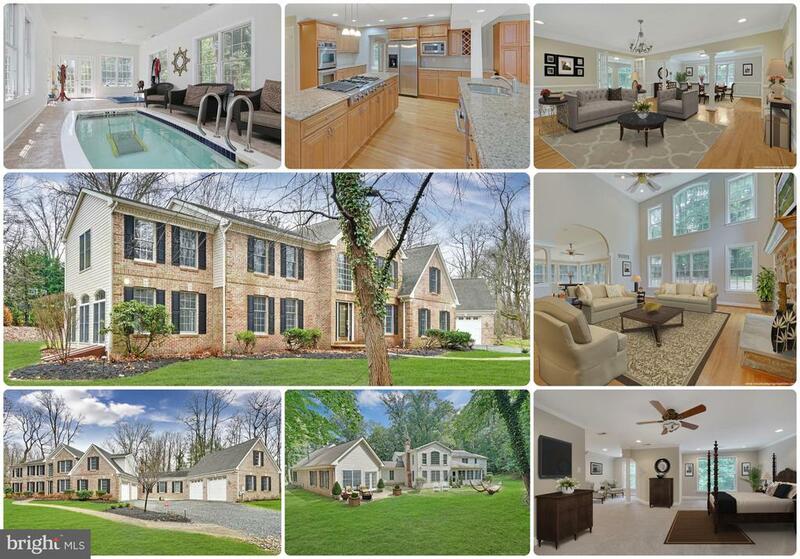 All Cherry Hill homes currently listed for sale in Cherry Hill as of 04/20/2019 are shown below. You can change the search criteria at any time by pressing the 'Change Search' button below. If you have any questions or you would like more information about any Cherry Hill homes for sale or other Cherry Hill real estate, please contact us and one of our knowledgeable Cherry Hill REALTORS® would be pleased to assist you. "Here it is.... THE ALI HOUSE!! Muhammad Ali collector?? Well now you can own one of his personal homes! This exquisite home, Mediterranean in style, is one of a kind and built for a champ. The circular drive has double gates that lead you down the driveway into a true Haven. The double front doors lead you into an incredible entryway with gorgeous stone floors. The main floor consists of 4 bedrooms, one which is an ensuite, and a stunning master bedroom suite with spectacular master bath with tub, huge shower with rain shower and seamless shower doors. The kitchen with center island allows for easy flow with large gatherings, a beautiful greenhouse retreat for early morning meals, and a plethora of cabinetry and commercial appliances. Multiple living room areas make entertaining a breeze. A room of walls of glass is currently used as an artist studio with two sided gas fireplace overlooking the magic of the outdoors to inspire every artist. All of these rooms surround an outdoor living room with multiple level decks and a sumptuous hot tub for relaxing after a long day of work. A gracious floating staircase brings you to the lower level where you'll find a 12 foot long wet bar with seating for 10, cook top, bar fridge, dishwasher, and sink. A workout area, gorgeous paneled office and full bathroom complete the space. Step outside onto the pergola covered terrace and enjoy endless gardens, in-ground pool and patio, walls of stone , tennis court, basketball court, shuffle board court, gazebo, grill and lounge area and so much more! Need garage space? The home wouldn't be complete without it's 5 garages and outdoor parking!" 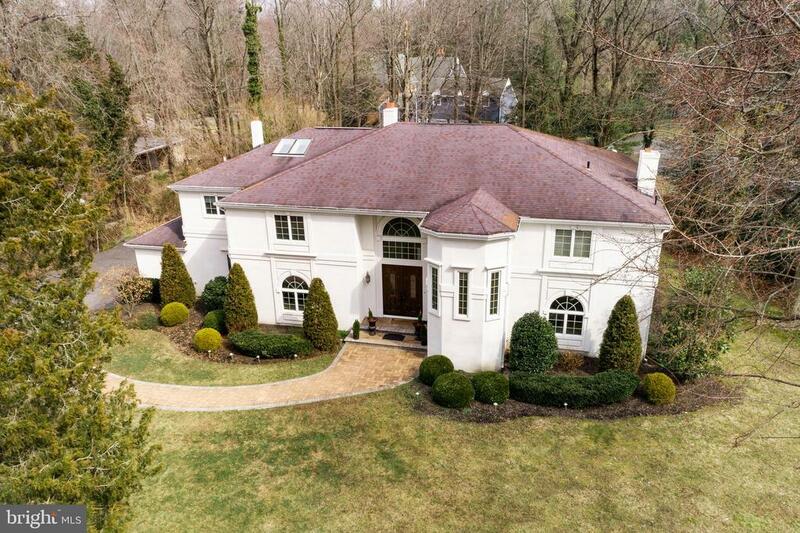 "The luxury home you've always wanted is available in Cherry Hill, NJ! A masterpiece of style and design, this one of a kind custom home is situated on 9.54acres in the secluded, sought after Hunt Tract community. Located in a great school district, in close proximity to Philadelphia, at a great price, this home really is a once-in-a lifetime opportunity! At 12, 344 square feet, this stunning residence includes six bedrooms in a separate wing, and a separate au pair suite adjacent to the kitchen. The dramatic entry foyer sets the mood, with Venetian plaster walls and heated, polished limestone floors. The elegant staircase leads to the second floor master suite, which includes a sitting room, bedroom, luxurious bath, two fireplaces and four walk in closets. The recently updated gourmet kitchen includes custom cabinetry from Smallbone of Devizes, a British furniture maker. There a top-of-the-line Viking stove and double ovens, a warmer drawer, a SubZero refrigerator, granite countertops and backsplash, a center island, and tumbled limestone flooring. At one end, the kitchen offers a sitting area with a fireplace, two breakfast areas, and a butler's pantry with a sink, refrigerator and wine cooler. The other end of the kitchen opens to an informal dining room with French doors leading to the veranda. The formal dining room, accented with custom built-ins and plenty of natural light, opens in the formal living room. The great room features a custom bar, wine/humidor, a pool table, projection TV, breathtaking custom wood floors, and French doors to the veranda. A beautiful study features custom carpeting, custom built-ins and bookshelves, and a stone fireplace. The peaceful den includes custom built-ins and an incredible full-wall stone fireplace. The main level bedrooms have Jack-n-Jill baths, two additional full baths, a secondary laundry room and stairs leading to a large entertainment room. This home is the perfect multi-generational offering a separate ex"
"Look no further! Over 5000 sq foot custom home. This home has it all. Tennis courts, in ground pool with cabana, upper level balcony, renovated gourmet kitchen with 2 DISHWASHERS and stainless high end appliances, 5 gas fireplaces, walk-in closets with organizers, heated towel racks,toilet seats, and floors upstairs, wet bar in the living room, dual stone gas fireplace in the living and family rooms. Master bedroom suite has everything you could want: sitting area with gas fireplace, ceiling fan, built-in shelving, sliding doors to the upstairs balcony, dressing area, Steam Shower, skylights, 2 HUGE organized walk-in closets with cabinets, TV on recessing stand, recessed lighting, and master bathroom with walk in shower, double vanity with granite and heated floor. 6 Zone heat/ac and the list goes on and on. You must see this home to appreciate it." 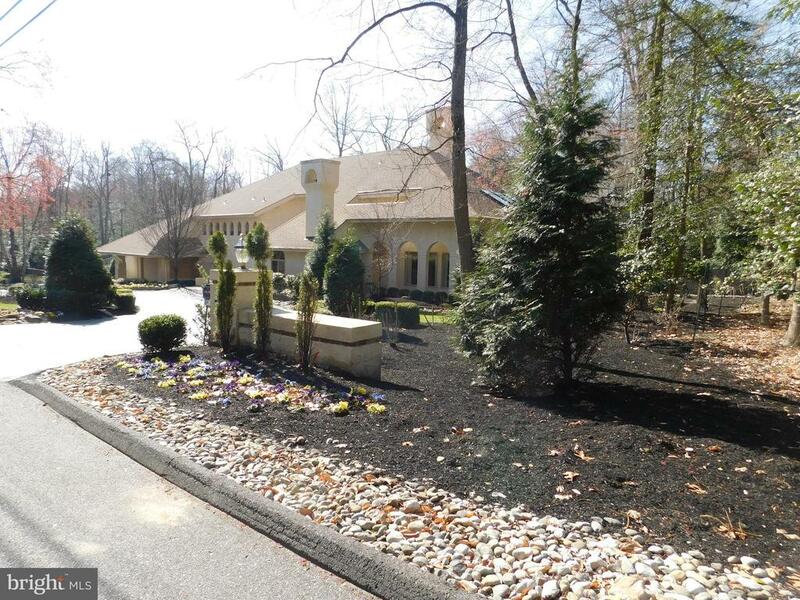 "Custom executive home on one acre wooded lot. Too many upgrades to mention all of them. Entrance boasts a 2-story foyer with dual turned staircases and impressively striking chandelier. Main floor has open floor plan with 10' ceilings throughout and 2-foot custom marble tiled flooring. In-Law suite w/ private bath, executive office, and laundry room all on main floor along with large living room and family room w/ gas fireplace. Chef's Kitchen with granite countertops, stainless steel appliances, 42' cabinets, walk-in pantry, and center island. Master Bedroom has sitting room, 2 walk-in closets and luxury master bath. Princess suite and 2 additional bedrooms on upper floor. 4 Car Garage. Walkout Daylight Basement is entire footprint and has been roughed for plumbing and ready to be finished. Make it yours today!" "Luxurious living in a class of its own! 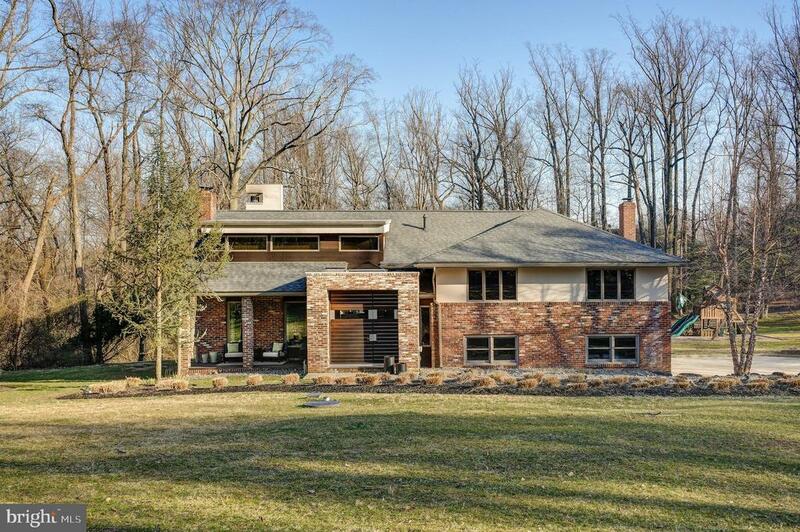 This spectacular home is perfectly sited on one of the best lots in Cherry Hill, in the esteemed Hunt Tract neighborhood, overlooking 3.8 acres of wooded splendor. The stunning French Provincial manor will impress you and your friends from the moment you come down one of the prettiest streets in town, Munn Lane. The circular paver driveway with its fountain and the beautiful front terrace magnificently frame the entrance to the home. Open the beautiful front door to a 2-story grand entrance hall with marble tile flooring and a fabulous curved staircase. Beautiful and classic millwork adorn all the formal areas. This stunning home seamlessly blends a multitude of one-of-a-kind spaces with sophistication, elegance, and warmth. The spacious living room opens to the front terrace, has a marble gas fireplace and access to a lovely music or library space. A butler~s pantry connects the formal dining room and kitchen area for ease in entertaining. The chef~s kitchen is a showstopper, complete with a large central island, granite counters and glass tile, premium stainless appliances, and a large casual dining area with panoramic views. A harmonious flow into the family room with a vaulted ceiling, skylights, stone fireplace, and back staircase to upper level, provide the combined kitchen/family room space that everyone wants today. Also off the kitchen area is a gorgeous sunroom drenched in sunlight. Both the kitchen and family room open to the upper patio terracing down to the pool area. This is so fabulous! 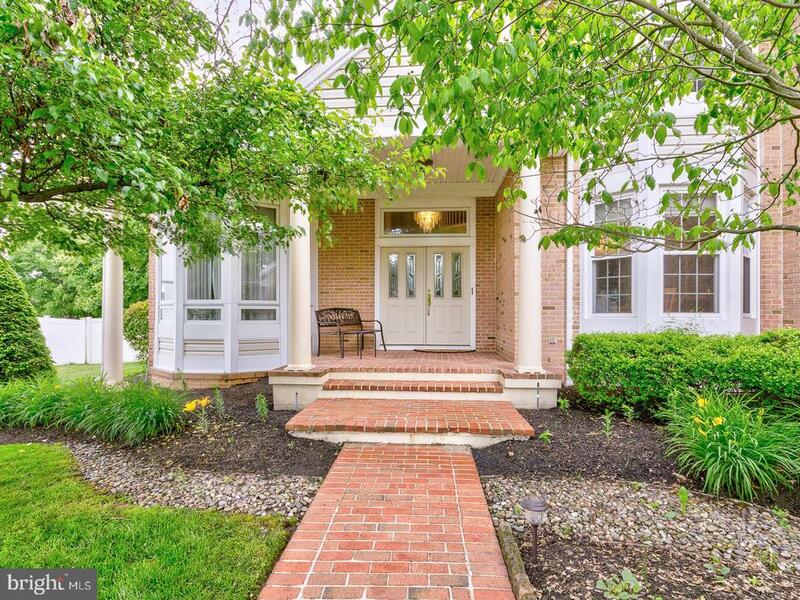 The heated inground pool, the rolling lawn and terraces, the pool house with its own full bath and the picturesque privacy make it hard to believe you are only 8.5 miles from Philadelphia! Back inside,a guest suite on the 1st floor is totally separate from the 4 bedrooms upstairs and comes with its own full bath. A laundry room, powder room and access to the 3 car side turned garage complete this level. Upstairs, the expansiv"
"This home is a Custom Built Contemporary Style Home that is located in the desirable Voken Tract Section of Cherry Hill. The exterior has great curb appeal and features professional landscaping, solar landscape lighting, mahogany front porch, cat walk to cement patio sitting area, blue stone porch with blue stone steps to the aggregate patio with built-in kitchen and bar seating area, EP Henry retaining walls and built-in sitting benches. This home boasts a custom front door leading to the entry foyer with skylight and brick and stone alcove, formal living room with gas log fireplace, formal dining room with stone wood burning fireplace, state of the art kitchen with Poggenpohl cabinets and high end stainless steel appliances, office with beamed ceiling, 5 bedrooms , 4.5 baths, family room with brick wood burning fireplace, wine tasting room, laundry room, large game room with fireplace and two car attached garage. Come view this one of a kind home." 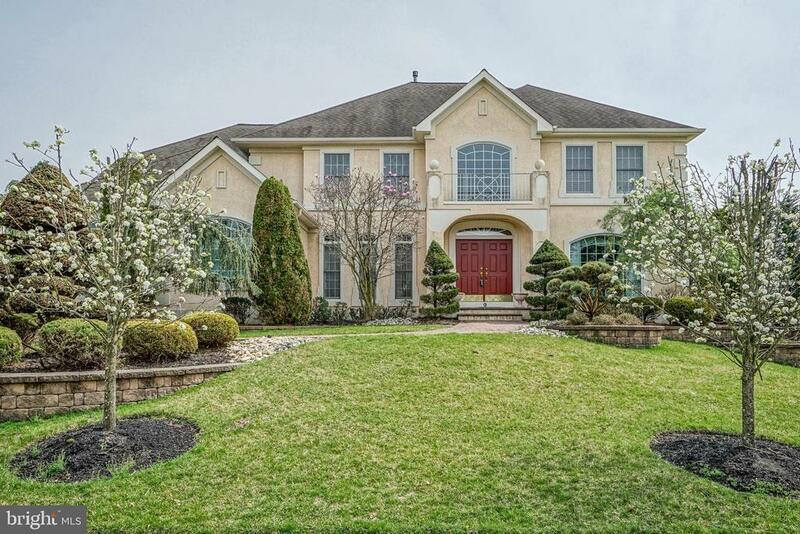 "Welcome to the Prestigious HUNT TRACT of Cherry Hill. 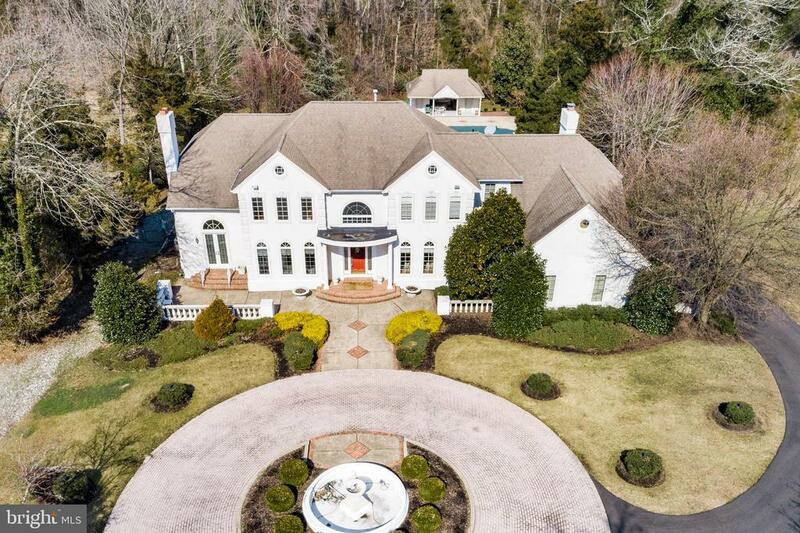 You will drive up this circular driveway to this custom built stone 2 story Colonial, One of a kind sitting on 1.6 plush acres, Enter through the 19x14 2 story foyer with marble floors and massive wood staircase, Through the spacious kitchen with granite countertops, all appliances and breakfast room that overlooks 23x18 fam room, Onto the 20x17 formal dining room and 20x16 living room with stone fireplace, All floors are marble hardwood and imported tile, Up the massive staircase to 5 huge bedrooms, 3 baths, plus a spacious 23x20 master suite with marble bathroom, whirlpool tub, bidet and large shower, his and her walk-in closets, Proceed to the lower level to a 23x23 fully equipped summer kitchen for the entertaining fam, threw onto a 35x28 game/entertaining room with stone fireplace and bar, threw you move onto the 16x10 wine seller, From the game room you access French doors to 38x15 enclosed patio, The entire home has Anderson windows, Custom window treatments, Numerous appliances and a separate well for irrigation, 2 zones gas heat and central air, Plus 3 car attached garage, The backyard tops everything off with 20x40 inground pool, Cabana/Bathhouse with gentlemen's and ladies room, 30x30 pavilion for those huge celebrations, This home is without a question a private resort with construction and the finest quality materials that is not comparable, with the finished lower level this home is almost 7,000 sq. ft. Must Send Prequel to Listing Agent before showing." "Entrance from Hidden Lane. 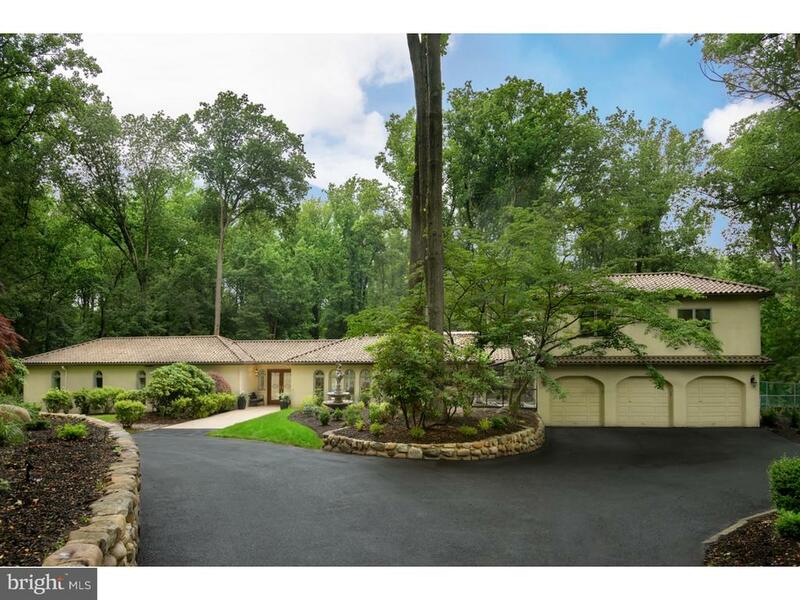 Completely Custom and Newer home in the east side of Cherry Hill with a professional rubberized surfaced Tennis court on over a 1.5+ acre private lot with Public water and sewer. Priced to sell fast!! Gorgeous home offers a 4 Bedroom Five and a half Bathrooms, 3 car Garage, second Kitchen, Finished Basement and upstairs open lounge for entertainment. Homes like this don't hit the market often so make it yours now!! Nicely landscaped front yard offers circular driveway with EP Henry pavers throughout and a fountain. Correct no concrete Pavers in front and back yard. This home offers over 50+ Anderson Windows and over 60+ recess lights. Living room is custom designed and offers 22 cathedral ceiling with tile inlay in the floors. Open airy and spacious Gourmet kitchen offers Custom design cabinets & granite countertops, wet bar, butlers pantry, kitchen pantry with Subzero refrigerator and stainless steel appliances open to breakfast/sunroom. First floor Master SUITE offers a separate office, separate Sauna, Steam Shower, Jacuzzi, dressing room and spacious his and hers closet. Entire home offers hard wood floors, solid wood doors, and custom tiles. A separate prayer room is custom designed on first floor closer to kitchen as well. First floor powder room also offers modern design and is conveniently located near mud room. Upstairs each bedroom has its private full bathroom and walk in closet. One of three upstairs suite also offers a Jacuzzi. Open entertainment lounge upstairs overlooks the foyer. Finished Basement with a second Kitchen and a full bathroom can also accommodate over 150+ seating w/large stage for concerts. 4 Zone Heating and Air, 3 Water heater out of which one is separate for master bedroom suite. Prewired music system with high grade speakers as well. Back open yard offers Pavers and built in Natural Gas Barbeque with large sink for outdoor entertainment!! Close to Bridges, shopping and great schools!! This list can go on an"
"GORGEOUS NEWER HOME IN LOCUSTWOOD! This home is absolutely gorgeous and ready for you to move right in! Upgrades abound in this home - the Builder spared no expenses! Enter into Stunning 2-Story Grand Foyer with Chandelier and Beautiful Staircase. Features of the First Floor Include: Expansive Formal Living & Dining Rooms with shadow box, chair & crown molding and Sliders to Back Deck; French Doors to First Floor Office; Gleaming Hardwood Floors throughout the house; Beautiful Kitchen with Stainless Steel Appliances, Double Stove, Upgraded Cabinets & Counters & Center Island; Open Family Room with 2nd Staircase, Cathedral Ceiling, Fireplace & Skylights! Second Floor Features Generously Sized Bedrooms; Jack & Jill Doors; Master Suite with Tray Ceiling, Private Bath featuring Garden Tub, Glass Shower & Custom Ceramic Work. Just a few of the many other features of this home are: 3 Car Attached Garage, Beautiful Landscaping & Full Large Finished Basement, large fenced in backyard. The property in conveniently located with in walking distance to Wegmans Shopping Center, and only 10 minutes to Center City Philadelphia." "Absolutely exquisite and meticulously maintained..... This 6 bedroom home boasts quality and luxury... Recently painted throughout in a soft neutral tone. The Grand Foyer welcomes you into this elegant home graced with a home office (possible bedroom) designed with rich wood built in's , beautiful family room leads through French doors to a cheerful sunroom, massive kitchen, granite countertops with high end appliances, sliding door leading to two custom decks and paver patio. Grand Master Suite includes a sitting room and a luxurious master bath. 2nd bedroom has its own private bath, 3rd and 4th bedrooms have a jack and Jill bath, professionally landscaped with great design including an irrigation system and security system... 3 Fireplaces...Last but not least the basement hosts a multi-purpose room (game room) 2 bedrooms and an all marble full bath.... Great for an au pair. Too many amenities to mention ...Do not miss this beauty." 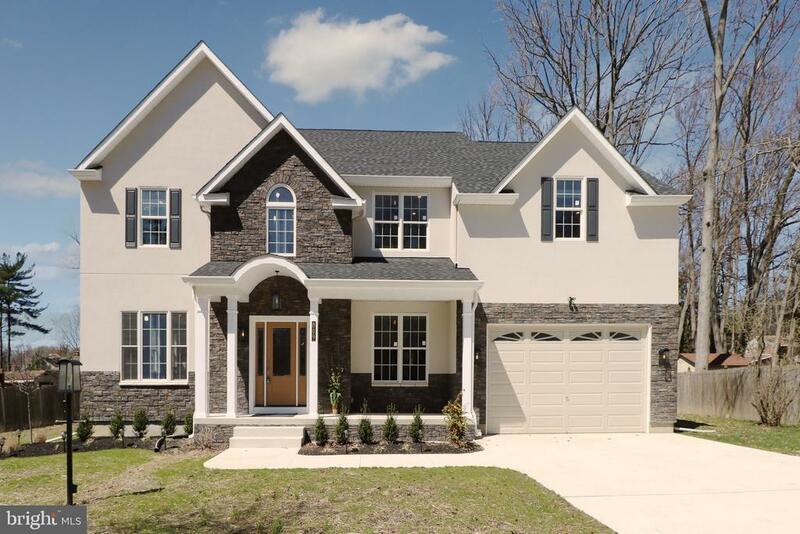 "This magnificent Coventry Model with an open floor plan has 4 bedrooms, 4.5 Baths, 3 car garage, full finished basement and is located in the desirable neighborhood of Short Hills. As you walk through the double doors the 2 story foyer has hardwood floors, a large arch window above that allows plenty of light and is open to the formal living room and Dining Room with large decorative pillars, faux painted walls, crown and chair rail molding and custom front accent arch windows. The 2 story family room has 2 stories of windows, a gas/wood fireplace surrounded by a 2 story stone wall. A half wall separates the Family Room & large eat in kitchen which is light filled by the extra transom windows that fill the back walls. The custom kitchen has a center island with breakfast bar, electric stove with downdraft system and silestone counter-tops throughout. There are double electric ovens, a desk area, pantry, 42 cabinets and french doors to the back deck. The laundry is found on the first floor with cabinets, utility sink, and access doors to garage and side yard. There is also a second staircase and a 1st floor office. The master bedroom suite has tray ceilings, a make-up vanity, his and her walk-in closets and a large bath. The master bath has 2 separate vanities, a corner soaking tub, large shower with bench seat, and linen closet. The second bedroom has a full private bath, walk in closet recessed lights and chandelier. The third and fourth bedrooms have wall closets, custom blinds and share a Jack & Jill bath. The full finished basement has 9 foot ceilings, a back staircase to garage, a huge bonus room with double wall closets recessed lights, carpet, full bath, another office, a work out room, 2 more additional rooms, and a huge utility/storage area. This well maintained home is bright, open and cheerful, with custom landscaping all on a half-acre of property." "TAXES JUST REDUCED!!! Come and check out this LUXURIOUS and IMMACULATE home in the prestigious VOKEN TRACT neighborhood. The first floor features a GOURMET chef's kitchen with JENNAIR appliances and two islands, a BEAUTIFUL open layout filled with tons of NATURAL LIGHT, an office, sunroom, formal living room, dining room, breakfast room, 2 story great room with stone fireplace and 2nd staircase with refinished HARDWOOD flooring. Walk through the tiled breezeway to the INDOOR LAP POOL. Four car garage with direct access. ELEGANT trimwork throughout. Upstairs is the MAGNIFICENT MASTER SUITE which contains a sitting area, walk in closet, and ENSUITE bathroom. There are three additional LARGE bedrooms and two more full bathrooms. This home is ready for a FAMILY to move in and make WONDERFUL MEMORIES!!!" "Drawing inspiration from grand European design, this stunning custom home in the Hunt Tract has the modern amenities and a wonderfully open floor plan that is so popular today, all seamlessly combined to make this an inspirational and standout home! Graceful craftsmanship and the finest materials such as the 9' custom oak double exterior doors and the imported Crema Marfil marble flooring in the elegant, large foyer, make for a grand entry that will impress from the start. The marble flooring continues into both formal living and dining areas, adding elegant continuity to your entertainment space. The living room showcases a beautifully ornate marble fireplace. The kitchen is immense and home to a 2nd double-sided fireplace, a center island, Crema Bordeaux countertops that compliment a dark tile backsplash, a butler's pantry, stainless appliances, and skylights over the dining area for lots of natural light. 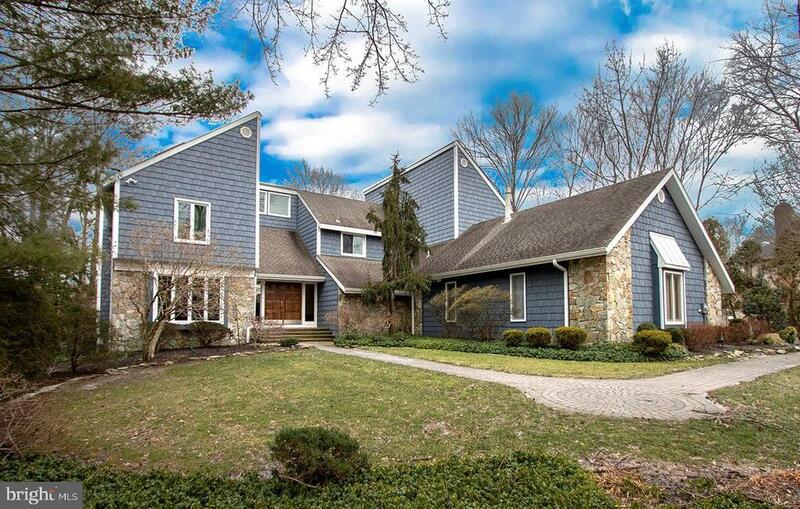 Adjacent and also warmed by the central 2 sided fireplace is a sprawling family room. You will love the stonework set around the fireplace featured in this magnificent room. French doors lead to a back deck perfect for rejuvenating yourself with coffee in the morning or a glass of wine at dusk amid your 1+ acres of leafy landscape. A large playroom/exercise room, powder room, library area and laundry room complete this main floor. Upstairs, the master suite is enormous, featuring a domed ceiling with recessed lighting, 2 walk-in closets, and a lovely private balcony. The master bath is a Roman-inspired spa bath with shower, jacuzzi tub and 2 custom vanities. Three additional bedrooms are all very large and share a spacious full bath with dual vanity sink. and a lovely common gathering space with a skylight. A small cellar is great for storage and the exercise room could easily be converted back to a 3 car garage if that is your desire. Situated in a wonderful setting surrounded by amazing estates and homes, this is a truly great value in this amazing Cherr"
"Welcome to this unique custom-built home located in Siena, one of the most desirable neighborhoods in Cherry Hill. 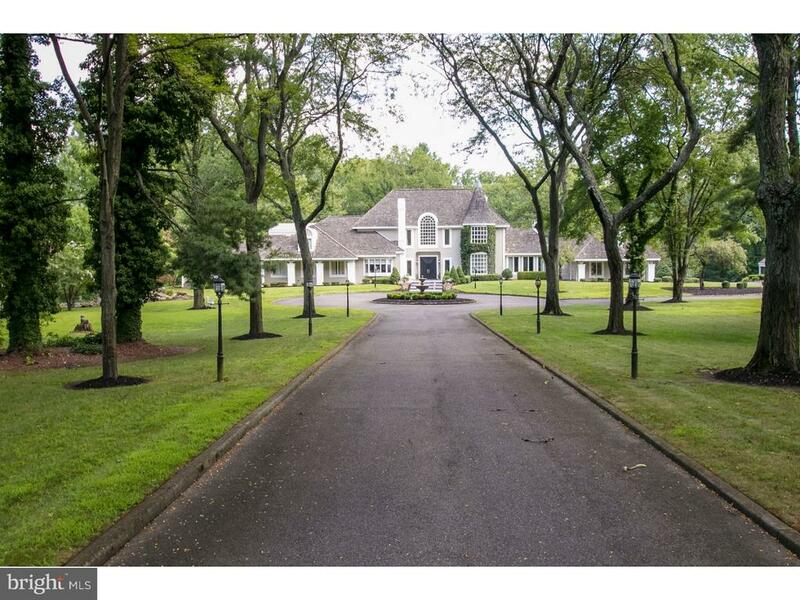 This magnificent home is situated on .46 acres on a private cul-de-sac. The home has been loved by the original owners and it shows! Walk into this immaculate and well-maintained home and enjoy all the features. This house boasts a grand two-story foyer and family room with a perfect open floor plan. Upon entering the home there is a charming sunken living room with exquisite exposed brick. The kitchen opens to the two-story family room with a full wall of windows, which allows the natural light to shine through. The over-sized dining room is adjacent to the kitchen offering a two-way gas fireplace, great for those special occasion dinners. The dining room has lovely white columns, beaded wainscoting, and wooded beams on the ceiling to top it off. The fireplace has a wood mantel in the dining room for elegance and stone for the kitchen and family room view. The kitchen is an entertainer~s dream kitchen with an abundance of space, beautiful cabinetry, stainless steel appliances, a commercial stove, granite counter-tops, separate built-in ice maker, an island that seats four, a beautiful back splash, built in microwave, and an integrated refrigerator. Use the French doors in the kitchen to walk outside to a picturesque backyard for those summer barbecues. Open the French doors to a very regal looking study, with a touch of contemporary flair, custom built-in cabinets with marble tops, and a great window with a view of the serene backyard. Walk upstairs to the amazing living space. Here, you will find a spectacular master bedroom with great windows and plantation shutters. The master bedroom has a huge walk-in-closet and two additional closets. The master bathroom was built for two which includes tiled floors, a large soaking tub, tiled counter tops, vanity with two sinks, private commode with a stunning tiled shower with a bench." "The Wait is OVER! Built by renowned, This 5 Bedrooms 3.5 baths with 9ft Ceilings with 2 car garages, is finally here for you to steal!! Featuring New 200amp service, LED recessed lighting throughout the entire house, dual-zoned High Efficiency HVAC, Tankless Hot water Heater, Stone front with stucco, Monogram siding, Temko Heritage roofing, Andersen double-hang windows and doors. OPEN Floor plan, 1st floor as you enter, you will find yourself with soothing Great Room, leads you the dinning n Kitchen area, formal dining room, office and eat-in kitchen with peninsula, lots of storage space, GE profile appliances, 36 gas cooktop, the 42 high moonlight cabinets and pantries, pairing with quartz countertop, luna pearl metallic flow glass subway backsplash, wet bar with dual temperature control wine cooler. If you love to cook and entertain, this is a MUST have! Not to mention all hardwood floor throughout the entire 1st floor. As you walk up with iron baluster stair case, hardwood flooring will continues to 2nd floor hallway, iron baluster stair case, large walk-in closet, double vanity, stand-alone soaking tub, ~Hansgrohe~shower system with 10in rain shower head. All room has ELFA~ closet system, luxury ~Karastan~ durable and soft ~Kashmere~ nylon carpets in all bedrooms. 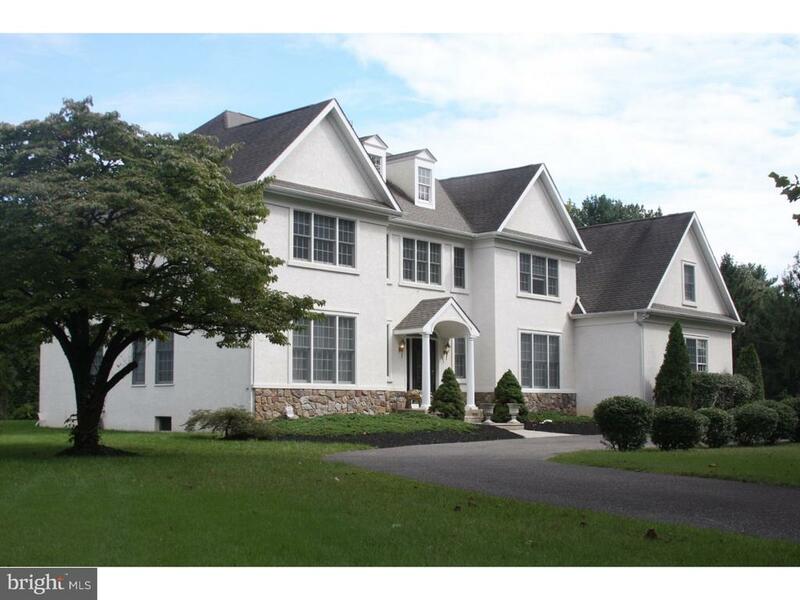 Enjoy this luxury living in Cherry Hill, close to all Shopping area and downtown Philly!" "Improved Price! This custom built home is situated on the largest lot in sought after Wilderness Run with a one of a kind backyard oasis and over 4,300 sq ft of luxury living space. The impressive exterior of this home can't be overlooked as it offers brand new siding, all windows and sliding glass doors that are maintenance free with a lifetime warranty! As you walk into the oversized foyer you'll be in awe of the natural beaming sunlight coming through the floor to ceiling new windows leading out to a sprawling two-tier deck! The first floor boasts an office/study with oversized windows and a formal living room with a gas fireplace and new sliding doors leading out to the deck as well. There is a charming sitting room just off the kitchen that's a perfect reading nook or built for any type of relaxation. Enter into the custom kitchen to find new modern stainless steel appliances, custom cabinetry, an island with brand new gas range and hood as well as granite countertops and plenty of space for cooking. There is a large dining area that leads into a massive living room complete with wet/dry bar as well as a gas fireplace. The first floor of the home also features an at home gym room and full bathroom which can easily be used as a guest bedroom or in-laws suite. There is convenient indoor access to a huge 3-car garage offering tons of additional storage space. As you head upstairs you'll find a full master suite featuring a gas fireplace, vaulted ceilings, walk in closet with custom shelving, vanity area, HUGE master bathroom with jacuzzi tub and a one of a kind sauna! In addition there are 3 other oversized bedrooms complete with custom walk in closets and tons of natural light. The shared Jack and Jill full bathroom has been recently renovated with a new vanity, new flooring and new custom tile shower. The laundry room is conveniently located on the upper level of the home and offers additional storage space plus newer washer/dryer. 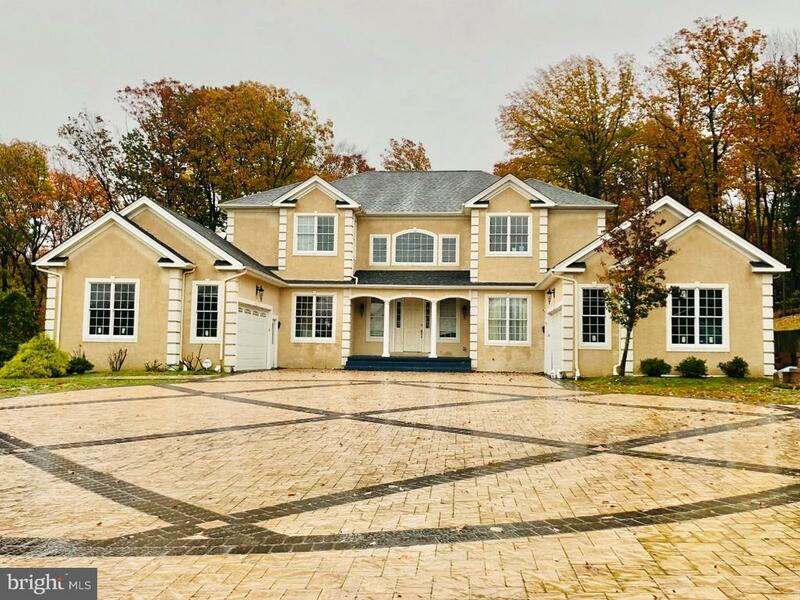 Head back downstairs and outsi"
"REDUCED Beautiful, custom built luxury home now available in East Cherry Hill, New Jersey. This prestigious almost 5000 square feet, 4 bedroom, 5 bathroom residence on almost a 1.5 acre lot, embodies both architecture and a warm-environment. One you have cleared one of the 16' entry gates the circular driveway will lead you to the front entry or the 3 car side entry garage. Cross the threshold to the grand entrance foyer and you are instantly drawn to the sweeping, curved staircase which introduces the aesthetic and architecture of the rest the house immediately on arrival. The mahogany stained oak staircase draws your eye up the two-story entry to the bridge overlooking both the entry and gathering room with cathedral ceiling. The floor plan offers great flow for large gatherings while also allowing intimate settings for smaller get togethers. Among the highlighted features and amenities are: Gourmet chef's kitchen equipped with two ovens, dishwasher, center island with gas cooktop and seating, walk-in pantry room and butlers pantry. Custom woodworking throughout the home, raised beaded wainscoting in the formal dining room, built-in media enter and storage in the familyroom, and custom wall unit on the bridge overlooking the familyroom. Cedar lined, walk-in master closet with cedar shelves and drawers, 5 baseboards throughout the home. A beautiful curved gallery wall in the open hallway leads you to the double French doors of the library or office. There are two bathrooms on the main floor, one at each end of the house for your convenience as well as a back set of stairs off the kitchen. This home has many features and amenities for your liking including the master bedroom sitting area with a three sided gas fireplace for your enjoyment. 2500+ square feet of open space in the basement awaits your design, plumbing already roughed in. 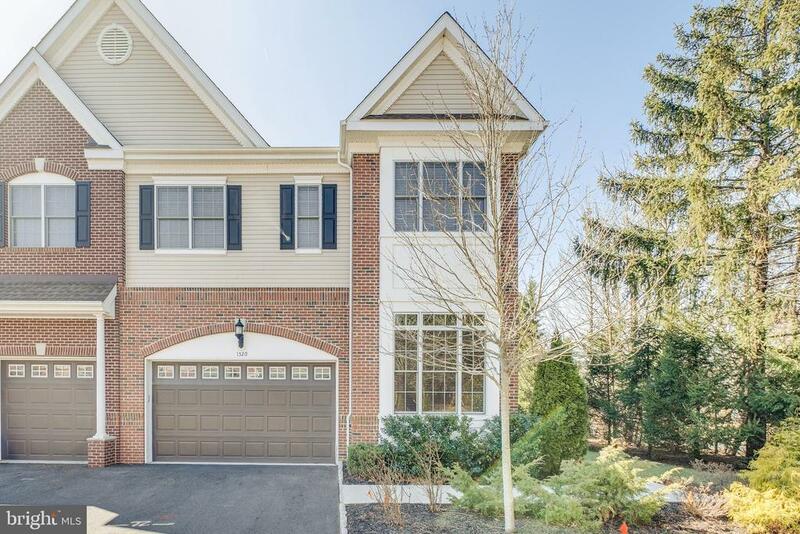 Located in the heart of Cherry Hill you are minutes from Philadelphia, with nearby access to major state highways, Interstate 295, "
"Beautiful updated 4 bedrooms, 2.5 baths, 3 car garage home that flows seamlessly from one room to the next, it's elegant, bright and spacious. The large foyer has a custom stained glass door and transom with side panels, sky lights, cathedral ceiling and Brazilian cherry hardwood floors which are also found in the living room, dining room, and family room. The formal living room has plenty of windows, custom window treatments and recessed lights. The eat in kitchen has skylights, a breakfast nook, patio doors to back deck, center island with bar seating and includes the sink and dishwasher. There is a wolf 5 burner stove, Dacor double ovens, Subzero refrigerator with 2 additional freezer drawers, with custom Poggenpoel wood cabinets and granite counter-tops. The kitchen opens to the family room that boast a stone gas fireplace, cathedral ceiling and double sliding doors to the custom wood deck. There is a first floor office, that can double as a guest room. The master bedroom suite has a wonderfully updated bath with a free standing elegant tub, glass enclosed shower with decorative glass tiles, floating double vanities with marble tops and make up area, there are 3 walk in closets and patio doors to a private balcony. There are 3 additional large bedrooms with plenty of closet space, an updated hall bath and laundry room are on the second floor. The yard is professionally landscaped and the roof is only 6 years old." 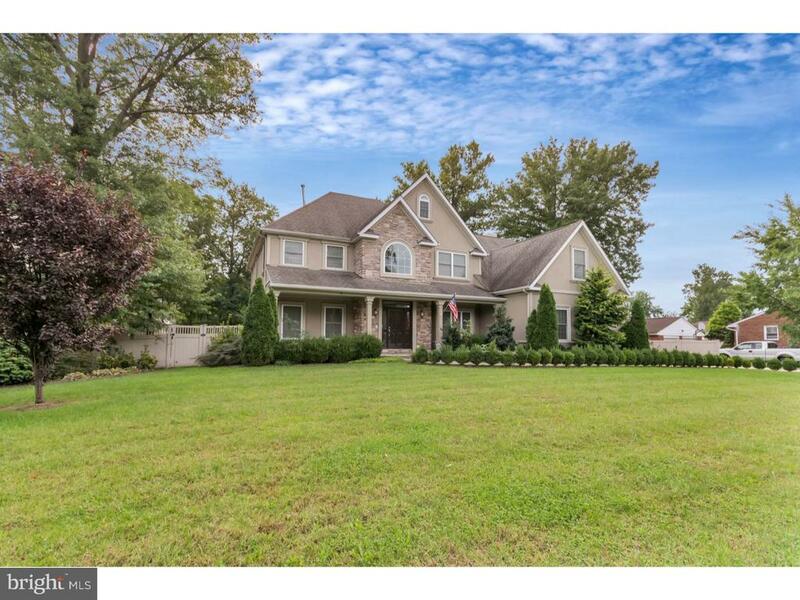 "Elegance at its very fine premiere home located in one of cherry hill's desired communities, on one of the largest lots Siena has to offer. The fine amenities of this home are too numerous to put here in detail. A few of those features include a phenomenal kitchen w/ Jenn-air range top, Bosch dw, Sub-zero rf, Corian counters, built-in desk and more cabinets than you could have dreamed for. Several of the bedrooms are configured to add more living space and to the master bedroom, more privacy. Featuring soaring ceilings, columns, complete neutral and updated decor t/o with all newer paint and flooring. The staircase to the basement is open from the foyer to offer a true lower level of living space. The elegant exterior design, custom brickwork, vinyl fencing, vinyl shed, massive 650 sq ft cedar deck, inground pool & almost 1/2 acre lot, make this home 1 of a kind!" "Welcome to 1520 Preakness, where only the best will do. This 5 year young home is for those individuals who have an appreciation for the finest attention to detail and where the littlest things mean a lot. 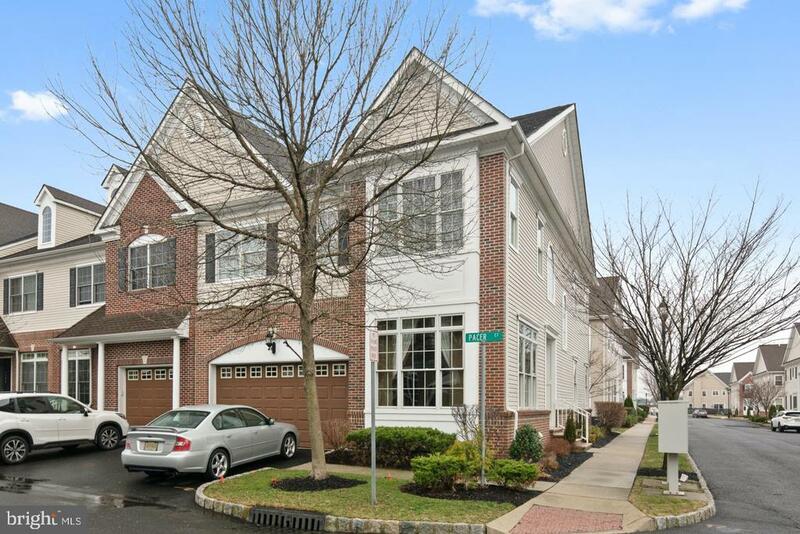 Situated in the prestigious Park Place at Garden State Park Community, on a ~No Through Traffic~ street on a premium, private lot, you~ll find this gorgeous Townhome. Offering 3 bedrooms, 3 full baths, 2 half baths, a 2 car garage and TONS of luxurious ~living~ space. Upon entering the front door you~ll be instantly impressed with the openness and flow of the floor plan. To the left is the formal living room, currently being used as an office. To the right you~ll begin your tour of the main living area. The expansive Great Room with gas fireplace is open to the large ding room and eat-in kitchen. The expanded, gourmet kitchen offers all the space, storage and high-end appliances the chef in the family will appreciate. The counters are granite, the flooring is tiled, but not your average 12~ rather larger 18~, and the stone backsplash is speckled in neutral colors that work well with the designer color scheme throughout. The extended counter was designed to accommodate stool seating, to enjoy the more informal meals. To top off the kitchen area, for your convenience, you~ll find the custom built-in desk space. The dining room is large and will be perfect for the family gatherings and holiday celebrations. Gleaming Bamboo flooring highlights the Foyer, Living, Dining and Great rooms and is just another example of ~simply the best~. Just off the dining room take the 8~ slider (not the standard 6~) to the beautifully hardscaped patio and rear yard. Back inside, the main level is finished off with a tiled half bath and access to the 2 car garage. Take the open staircase to the upper level where you~ll find 3 large and comfortable bedrooms, a lounge area and laundry room. 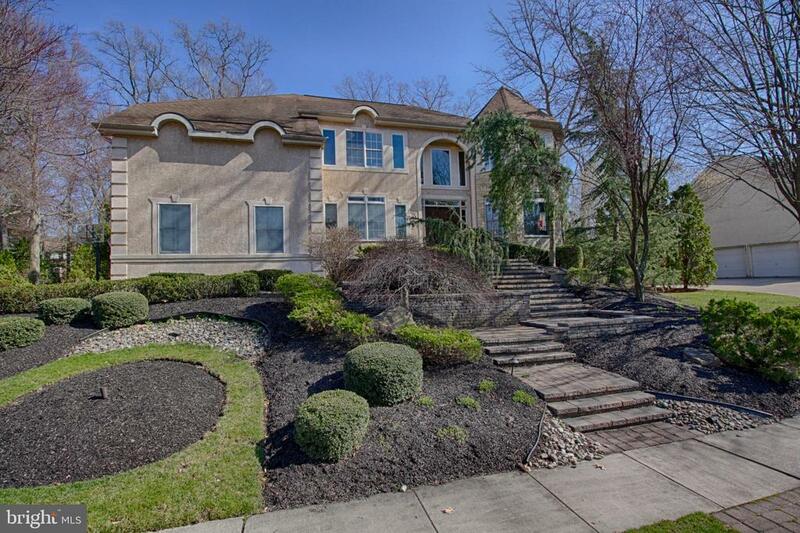 Through the double doors, enter the palatial Owners suite with 2 walk-in closets, a dressing area a"
"Welcome to this exquisite home located in Siena, one of the most desirable neighborhoods in Cherry Hill. This home has been loved by the original owners and it shows! Walk into this immaculate and well-maintained home and enjoy all the features. This house boasts a grand two-story foyer with a beautiful winder switch staircase and gorgeous crown molding throughout. Upon entering the home there is a beautiful sunken living room with exquisite crown molding. The kitchen opens to the two-story family room with vaulted ceilings and two new skylights, which allows the natural light to shine through. The family room also has a gas fireplace for those warm cozy nights, in addition access to the stunning inground pool and patio. This perfect backyard also offers great landscaping and room for a swing set. Open the French doors to a very regal looking study, which also has a fabulous view and access to the pool and patio through the sliding glass door. Walk upstairs to the amazing living space. Here, you will find a spectacular master bedroom with a large sitting area, vaulted ceiling, oversized windows and a huge walk-in-closet and linen closet. The remodeled master bathroom includes heated tiled floors, a large soaking tub with jets, granite counter tops, vanity, private commode with a pocket door, and a stunning tiled shower with steam shower and bench. Down the large hallway which overlooks the two-story foyer, there are three large additional bedrooms. There is a full hall bathroom and the third full bathroom is offered in the princess suite. Wait, that~s not all! Walk downstairs to the massive finished basement, great for entertainment, game room, or kids play area. There is an additional area of enclosed extra storage and a half bathroom for your convivence. Another great feature is the two car garage that leads into a large mudroom/laundry room, for those snowy or rainy days! Added extras: 22 new windows and three new slider doors. This h"
"Fabulous sprawling Custom home located in Cherry Hill's Voken Tract offers privacy and exclusivity! This home has been lovely maintained and expanded by the current owner with 6 bedrooms and 5 full bathrooms. As you drive up the impressive driveway you will find this very special home situated on 2.59 acres of wooded splendor. The warm and inviting foyer greets you upon entering the home. The home has been freshly painted in a warm, neutral palate and hardwood flooring is in almost all the home. The living room and dining room are spacious and flow together for great entertaining space for all your holiday gatherings. The kitchen has great space with wood cabinets, double oven, Subzero refrigerator, granite counters, tiled flooring and recessed lighting. Step down into the charming eat-in area with a fireplace. There is a large family room with cathedral ceilings, ceiling fans and plenty of windows. Off the eat-in area is the sun room with large windows that provides access to the amazing rear yard with an in-ground pool, wooden pathways, gazebos and lush plantings, truly a private oasis. Completing the first floor is large another room with a full wall stone fireplace that could be used as a den or office. The upstairs features a massive master suite with a covered balcony overlooking the rear yard, the perfect spot to enjoy your morning coffee. The walk-in closet with built-ins is huge and the master bathroom has double pedestal sinks, a Jacuzzi tub, shower and even a bidet. There are 2 other large bedrooms on this wing of the home, as well as an updated hall bathroom and the laundry room. There are 3 additional bedrooms in another wing of the home, one of which was the original master bedroom with an en suite bathroom and good closet space. There is another full bathroom for the additional bedrooms in this section. This home offers plenty of space and flexibility for gracious living and entertaining with a great location close to dining and shopping, ho"
"Only once in a blue moon does an opportunity like this come along. This is your chance to own this fully furnished, professionally decorated luxury townhome. The quality and the attention to detail will amaze you. Not a dollar was spared. At the time of construction $72,000 in builder upgrades were added. After taking possession an additional $96,000 was spent on more custom upgrades. Then $269,000 was invested in furnishing and decorating this master piece. YES, thats almost $1,000,000.!!! This is truly a very special home. If you appreciate the finer things in life this is the home for you. The list of upgrades are obviously too large to list. Schedule your private tour today." 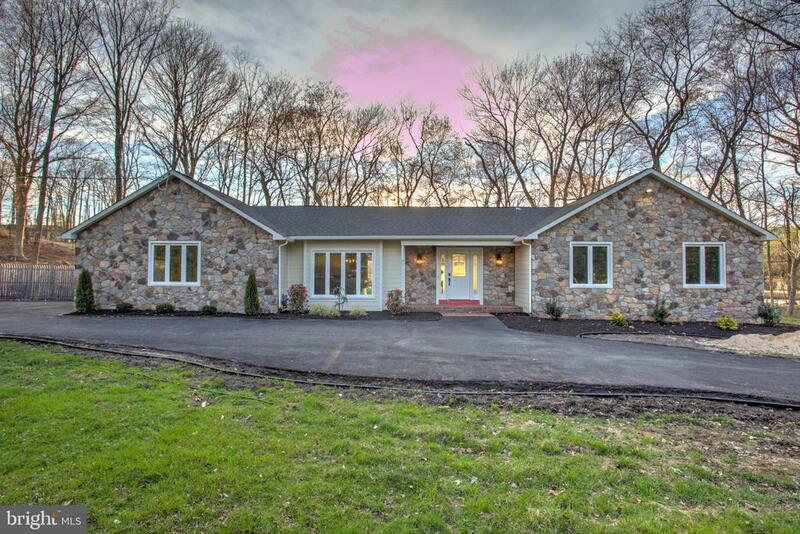 "A unique custom rancher in the prestigious Wilderness Acres development of Cherry Hill East that has been fully remodeled, interior and exterior. This home has countless features and too many to list, so make your appointment to experience it in person.This is single floor living at its best. Featuring 4 bedrooms and 3 full baths, large living room, formal dining room, modern gourmet kitchen with all new high-end appliances wrapped around in a two-tone quartz counter top and cabinet design. 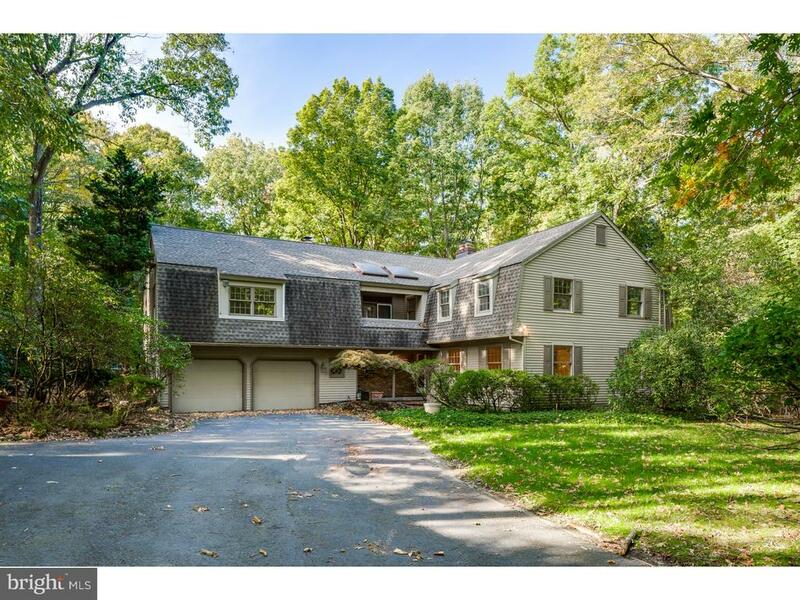 Solid exotic hardwood throughout with skylights providing plenty natural light and open feel. All new casement windows, doors, and high-efficiency HVAC and HWH were installed. The master suite can only be described as a masterpiece, it includes large custom organized walk-in closet, master bath with dual sink floating vanity, standalone soaking tub, and large custom glass enclosed shower.Outside, there is an enclosed sun room with access to an enormous deck and a custom heated in-ground pool with new liner, the property is situated on 1acre lot that is wooded in the rear and landscaped in the front. The roof is brand new along with gutters, cement siding and stone veneer in front."